Do you want a fun and engaging way for children to learn how to read and spell the days of the week in order? This product includes mini flashcards for each day that can be attached to a key ring. The child can practise learning the days of the week at school and even take the king ring home with them. Children truly love having something they can hold and keep with them. It gives them a fun and different way to learn and practise the days of the week. 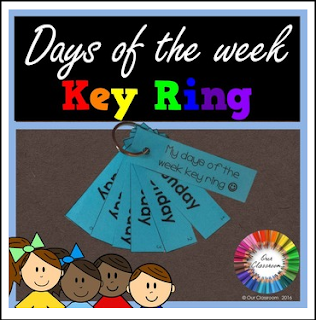 This key ring will give them a sense of ownership and helps them independently learn. Want a key ring for the months of the year too? Click here to download for free! If you love the idea of using key rings to help students learn, I have a range of different products that you might find useful. Please click here to check them out! Please click the green star to follow me for regular updates and new products.